Our well designed radio remote control has the ability to provide the simplest single function radio control to the most complicated fully proportional based remote control systems. Our well designed Radio Remote Control has the ability to provide the simplest single function radio control to the most complicated fully proportional based remote control systems. Our wide range of transmitters, from single function pushbutton transmitters to dual axis joystick and lever transmitters with feedback display options allow us to tackle every mobile wireless radio control application. 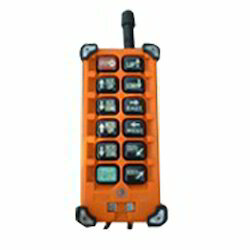 Our Radio Remote Control for various equipment are proven in a multitude of applications where wireless control provide safe efficient operation. From hydraulic equipment trailers to remote control of proportional track mounted equipment, concrete pump trucks and mobile truck cranes we have accomplished it all.